Learning from other marketing, sales, and business leaders is one of the most valuable ways to move your own business forward. 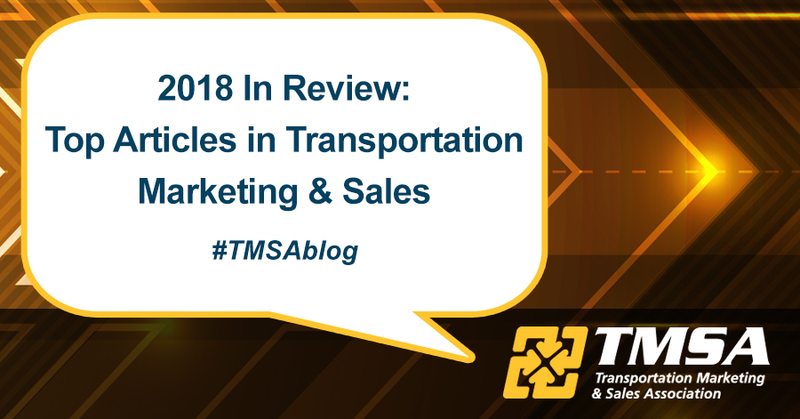 The Transportation Marketing & Sales Association brings together market intelligence and thought leadership that's specific and unique to transportation and logistics through our TMSA Blog. We've compiled the Top 12 articles of 2018 featured on the TMSA Blog - just in case you've missed them! 12. Transportation Spot Market Inversion. Routing guides are often broken and shippers need to go to the spot market to cover their loads - making it more costly than their budgets can handle. How are shippers responding to this challenge and what's their long-run view of a dedicated fleet? This article provides need-to-know information so that your company can appropriately react. 11. Think Change is Hard? Try Unlearning Supply Chain Management. Adrian Gonzalez of TalkingLogistics.com explains how TMSA members should change their supply chain management perceptions to shift their business and their sales/marketing results. 10. Blockchain in Logistics and Supply Chain. "Is Blockchain the Answer...or Does it Merely Beg Additional Questions?" Jason Ickert, a seasoned commercial leader who is hyper-focused on delivering innovative solutions for real-world logistics problems in his role at Energy Transportation Group, gives some insights. 9. Creating “Togetherness” to Drive Revenue Growth. Jeff Davis, founder of The Sales + Marketing Alignment Summit and TMSA Affiliate member, provides actionable insights for transportation and logistics firms to achieve marketing and sales alignment that drives revenue. 8. What if Your Top Sales Manager Quits? It's something you want to avoid. Ricardo Roman of Caliper, a human capital analytics firm practicing in transportation and logistics, gives practical advice on how to minimize the chance of your top sales performers moving on. 7. 10 Reasons Google Hates Your Website – and What You Can Do About It. Most transportation and logistics firms generate significant qualified leads through their website, yet many don't place adequate energy or resources to ensure it remains high on search engines. Chris Peer, Owner and CEO of SyncShow and TMSA Affiliate member, gives 10 pointers on how to ensure your website shows up high on search engine rankings. 6. How Sales Can Win Before 57% of the Buyer’s Journey is Over. There's a lot of talk lately about how the typical supply chain buyer has gone through much of the purchase process before even reaching out directly to sales. Have you adapted your sales process to reflect these changing buying practices? 5. 4 Ways to Increase Millennial Retention. Did you know that 40% of millennials see themselves staying at their current employer for at least nine years? Ricardo Roman of Caliper, a human capital analytics firm practicing in transportation and logistics, provides four ways to reduce millennial turnover and improve long-term organizational fit. 4. The Industrial Economy is Cooling: It’s Not Too Late to Negotiate Truckload Contracts. What happened with supply and demand in the fall of 2018? Shippers are clawing back, particularly in the truckload sector. "It's not too late to negotiate," says Jason Ickert, a seasoned commercial leader who is hyper-focused on delivering innovative solutions for real-world logistics problems in his role at Energy Transportation Group. 3. Trucking’s Secret Sauce for Product Success: Finding the Right Marketing Mix. Outsourcing supply chain-related activities continues to be on the rise. So it's no surprise that transportation and logistics companies whose core business relies on outsourcing non-core business activities also continue to turn to the outside when defining and executing their marketing strategy and activities. Brian Straight, Editor of FreightWaves, share insights. 2. Building Your Digital Audience with Content Marketing. More and more transportation and logistics firms are leveraging content marketing, automation, and digital best practices to generate business results. Joe Pulizzi, founder of Content Marketing Institute and previous keynote speaker with TMSA, outlines how to build a relevant relationship with your audience to generate new leads. 1. Shippers Don’t Want Your Old Marketing & Sales Tactics. The way today's shippers make their decisions and want to be sold to has dramatically changed - and leading shippers share their perspectives at the recent TMSA Logistics Marketing & Sales Conference. Erika DeBlasi, Marketing Coach at TranStrategy Partners, provides a summary of what these shippers say they want - and also shares top tips on how to better work with them. Comments on "2018 In Review: Top Articles in Transportation Marketing & Sales"